Jacaranda Cottage is a romantic retreat, full of the charm of yesteryear... ideal country getaway with cosy winter fire for chilly nights, exotic hot-tub jacuzzi-spa, & fabulous swimming pool to cool off on hot summer days. Discover the secret pleasures of this dazzling pink cottage set in picturesque tropical true turn-of-the-century history in a charming atmosphere... country quilts, cosy mozy nets, old-fashioned very-comfy brass-bed with warm doonas, pioneer memorabillia, a fun tank-style shower.. yesterdays collectables amidst todays mod- cons... TV/DVD/CD player, AIR-CON, fully self-catering kitchen with microwave, dishwasher! BBQ on shady verandah. Ideal for singles' country retreat, romantic couples' hideaway, girls' weekend-away, great for kids sleeping a family up to 5. Come & enjoy Jacaranda Cottage... it's full of surprises. Set on Queenslands Sunshine Coast in the heart of beautiful horseriding country. Explore glorious mountains & rainforests on horseback. Safe horses & cute little ponies... even donkeys & mules to amuse! Lots of wildlife with ducks & birds to feed. Friendly expert guides to look after everyone on horseback. Bicycles to ride, for the whole a tandem-for-two ... just 1 kilometer of easy cycling into Mooloolah village. Discover a great supermarket, bakery, bottle-shop & chic sidewalk cafe-restaurants. Bushwalking into local National Parks... visit the old dis-used railway tunnel built 1892.... try fishing in creeks & waterholes. Close to famous Sunshine Coast markets, glorious sandy beaches & renowned restaurants....Jacaranda Cottage is a secret country paradise! Come & enjoy! plus true-blue Aussie paraphernalia. Underwater World at Mooloolaba has the most amazing exhibits & shows from the ocean. You can play golf on world famous courses... visit the mysterious Glasshouse Mountains & learn about the local Aboriginal folk legends. 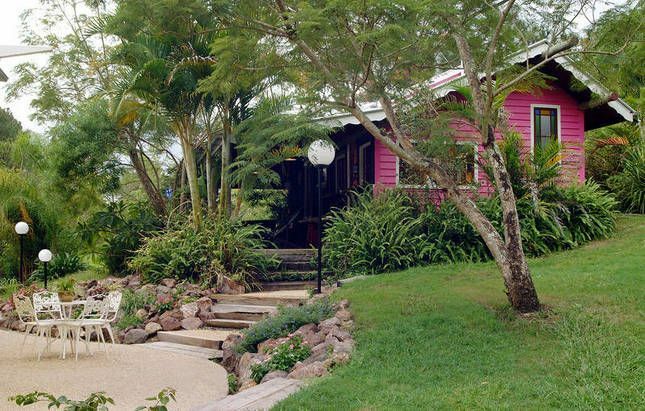 Take the spectacular scenic drive-tour to Maleny, Montville & Mapleton for collectable fine arts & & lots more to amuse on a Jacaranda Cottage holiday! Our party of 2 adults and 4 teens had a terrific time at Jacaranda. Sweet cottage with loads of character, and host Atalanta that was incredibly welcoming and so hardworking. Brought heaps of boardgames for us to play and very accommodating with our requests. Very clean and warm. We will try out the Frangipani Cottage next time with a bigger group. The most amazing, quirky and peaceful place I have ever stayed in. The host, Atalanta couldn't do enough to make our stay incredible. We had the best girlie long weekend and didn't want to leave. Beautiful location and accommodation was perfect. The riding school was close enough to walk to. The horses and donkeys so friendly. Can't wait to return. We recently stayed in one of Atalanta's lovely pet friendly cottages. It is difficult to fault our stay. Although in the midst of atrocious weather, the natural surroundings and rustic yet comfortable cottage was just what we needed to unwind. I would highly recommend that if you are after a relaxing stay in beautiful and tranquil environment you should head to Mooloolah Valley.